The oak is associated with the tree giant, which is on the circuit goes to the cat scientist. But this is a fairy tale. The reality is the extensive use of oaks in the landscape design. To grow oaks from acorns – it is interesting, but long. It is better to transplant the tree ready. Unlike other not fruit trees, oak has one feature – an extremely long taproot. And if the majority of plants at topping taproot (pinteresque) begin intensively to shape the root system, oak from the slightest damage to the main root dies. Therefore, transplanted oaks is recommended no later than age one. 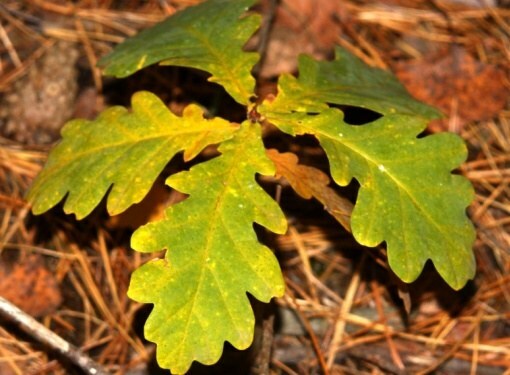 Watch young oak in the woods or near the road in the summer. His year will be no higher than 20 cm, with a thin stalk. Better to not dig up the oak of the forest near the road where no other trees and the soil their roots are braided. When digging you should pay attention to how towards the cardinal growing tree. Put it on a plot it is best same way. In August-September, dubka procures pit. If the tree is small enough, the pit width of 30 cm, but in depth it should be at least 40 cm Can be put on the bottom of the pit a little leaf mold or decomposed manure (latest mix mixed with soil). Oak intended for transplantation, dug carefully and deeply. Taproot at the annual dubka may be 25-30 cm long and very thin. After the tree is dug, it should be carefully removed from the ground, keeping the roots all the soil. The roots of the tree wrapped in newspaper. You can wrap the roots with newspaper tightly enough and when planting them not to shoot – after a while newsprint decomposed in the earth itself. The seedling drops into the pit so that the base of the trunk (root collar) was 5 inches above ground level. The soil in the pit after planting a little subside, and the root collar will be at the desired level. After planting the ground is well watered. Young thin oak must be fixed between two wooden stakes. Young oak trees are damaged by garden pests, especially powdery mildew. This fungus affects the leaves, which can be dangerous for immature plants. So to prevent the tree in the spring, you can spray special preparations. Seedlings of oaks are afraid of drought. Watering, especially in the first year after transplanting, they often need. You also need to weed out tree trunks from weed and keep it clean. Oak plot requires regular pruning, at least twice per season. In thickened the crown to actively develop the disease, so the trim need not only the growth and thickening of the branches from the trunk.